You will find your specific uniform information is listed under the year you were born, not the team you are playing on this season. ie: if you were born in 2002 but you are playing on a 2001 team, you will still find your uniform information listed with the 2002’s. Player numbers were assigned based off of the year you were born. All odd numbered years (2005, 2003, 2001, etc.) were assigned odd player numbers. Even numbered years (2006, 2004, 2002, etc.) were assigned even player numbers. The reason is because this will allow for player to play up or be moved to different teams without a number duplication ever being a problem. There will not be any duplicate numbers given out within a birth year. So, you will be the only player with this particular number in the year you were born. All Goal Keepers are assigned either #1 or #13. These two numbers are reserved for Goalies only. BSC policy states that no number request or change of number will be allowed. Please allow up to 3 weeks for delivery from Soccer.com. To ensure you receive the emails from Soccer.com, please mark the following email address' as approved in your spam service: custserv@sportsendeavors.com and Soccer.com. Customized items are not refundable by soccer.com. All uniform items purchased are not refundable by BSC. The uniforms will be shipped by Soccer.com directly to the parent/player. Parents may also purchase a wide variety of FCThunder spirit wear from Soccer.com. 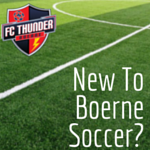 Lastly, if you did not try on uniform sample sizes during tryouts, and you would like to do so, please send me an email and I will set up a time to meet you at the Boerne City Park office (by the tennis courts) so you can try on uniforms in the nice cool air conditioned room.